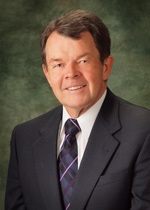 Judge Kent J. Dawson is a United States District Court Judge for the District of Nevada, for which he received a lifetime appointment in 2000. Prior to that he served as City Attorney for Henderson from 1972 to 1979, a Justice of the Peace from 1995 to 2000, and as a lawyer in private practice. He attended Weber State College in Ogden, UT and received his Juris Doctor degree from the University of Utah School of Law. He is licensed as a private pilot with instrument and multi-engine ratings. He and his wife, Ruth, have four children and six grandchildren.